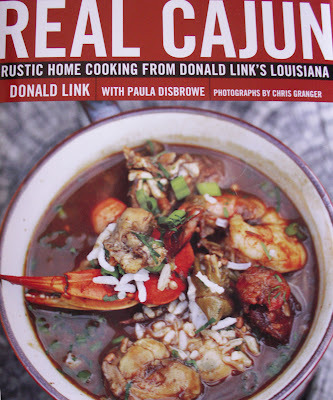 My copy of Real Cajun: Rustic Home Cooking from Donald Link’s Louisiana arrived last Thursday, and I was like a kid opening his first gift on Christmas morning, shuffling for something to open the box with, flinging aside the bubble wrap to stare into a beautifully photographed crock of Gumbo. 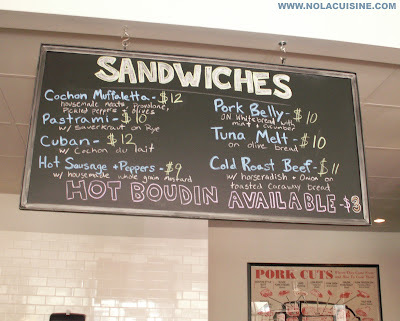 The title is in big bold white letters REAL CAJUN, as if to say, ok, enough with the blackening already, enough with the notion that everything Cajun is super spicy, enough with the Bourbon Chicken in the food courts; let’s get down to the nitty gritty. 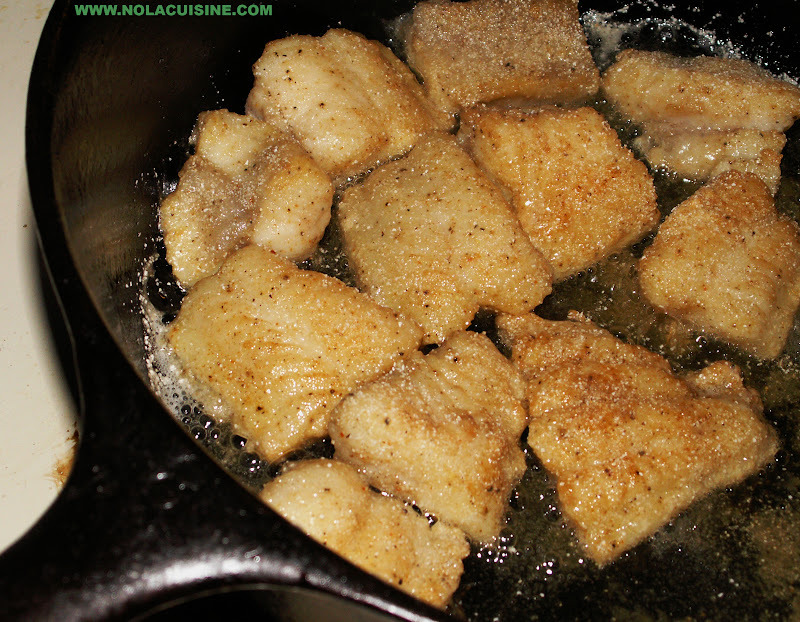 Real Cajun, rustic, simple, home cooked meals. 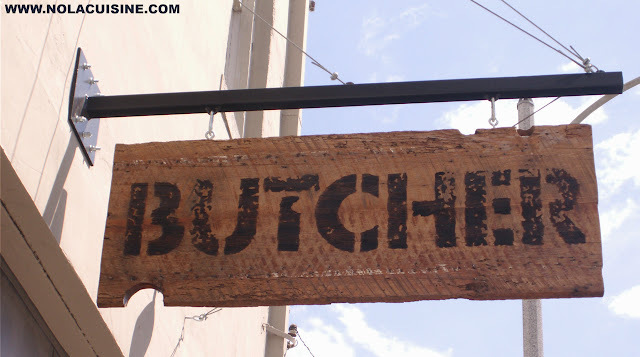 It seems only fitting that the Chef owner of Cochon, and Cochon Butcher (no, I’m not forgetting Herbsaint), would have homemade Bacon as the first recipe in his cookbook, with the first “chapter” bearing the title La Vie Cochon, with recipes including Tasso, Boudin, Pork Belly Cracklins, and more. The most mouthwatering recipe in this chapter, in my humble opinion, is Smothered Pork Roast over Rice, a simple recipe based on his Granny’s preparation, with a photo so beautiful that I swear you will try to lick the wooden spoon before the sauce drips back into the pot. I have to admit that I was a little disappointed that he didn’t include more Charcuterie than he did, but I totally understand why he didn’t, keeping it practical for the home cook I guess. 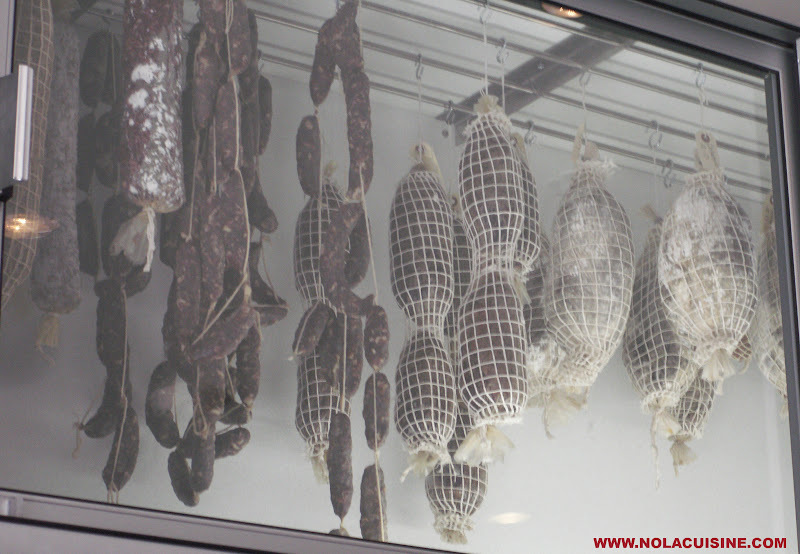 (I have my fingers crossed for a follow up book surrounding Louisiana Charcuterie, or a Cochon cookbook.) 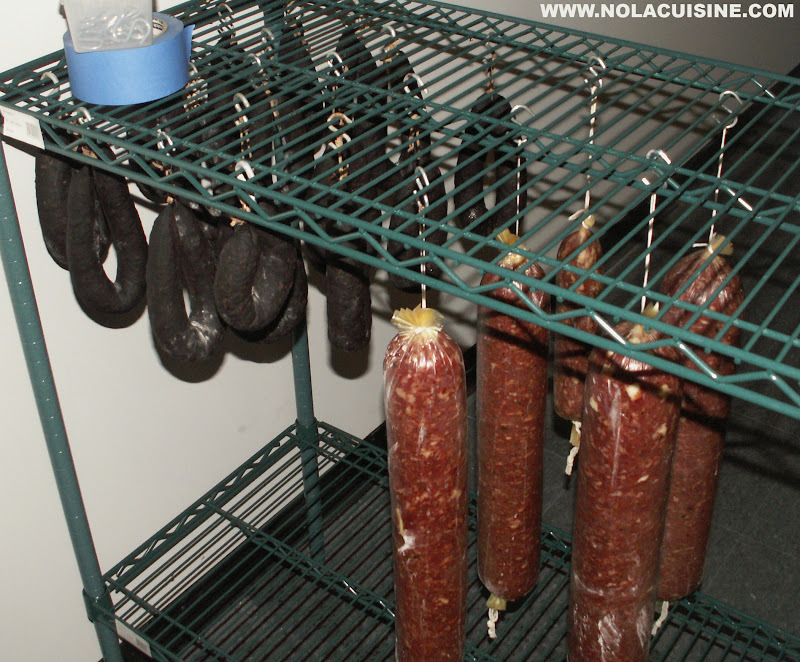 Don’t get me wrong though, the Charcuterie recipes that are included, Bacon, Boudin, Tasso, Deer Sausage, etc.. are top notch, I can’t wait to try Chef Link’s Boudin recipe, the photo is outstanding as are all of the photos in this book all by Chris Granger. 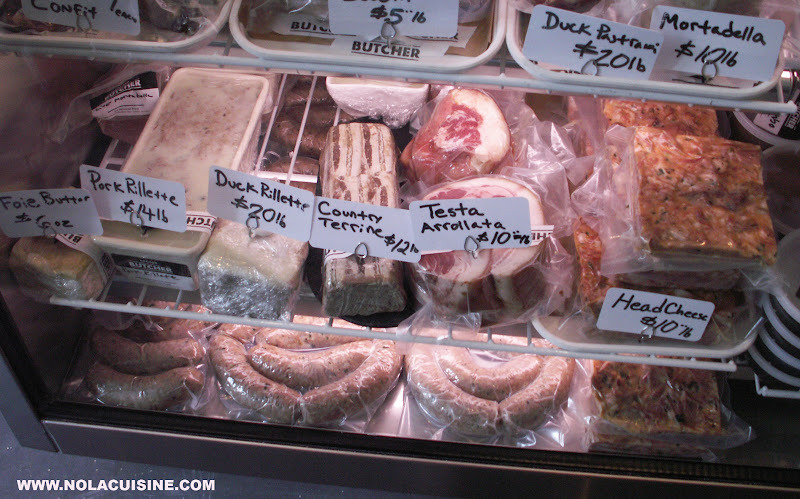 I was looking for Chef Link’s Andouille, Hog’s Head Cheese, and Creole Mustard, but the recipes that filled these spaces totally made up for it and more. The book’s recipes are wonderful in their simplicity (this is not a restaurant cookbook, although some of the dishes from his restaurants appear) with beautiful photographs that make me long to be in the stifling heat of Louisiana everytime I look at them. 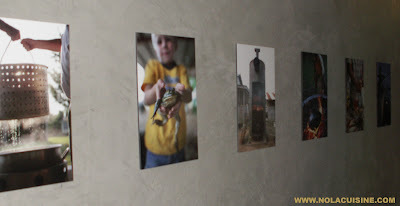 Some of the photographs from the book are hanging on the walls of Chef Link’s private dining facility Calcasieu, which is next store and upstairs from Cochon Butcher. 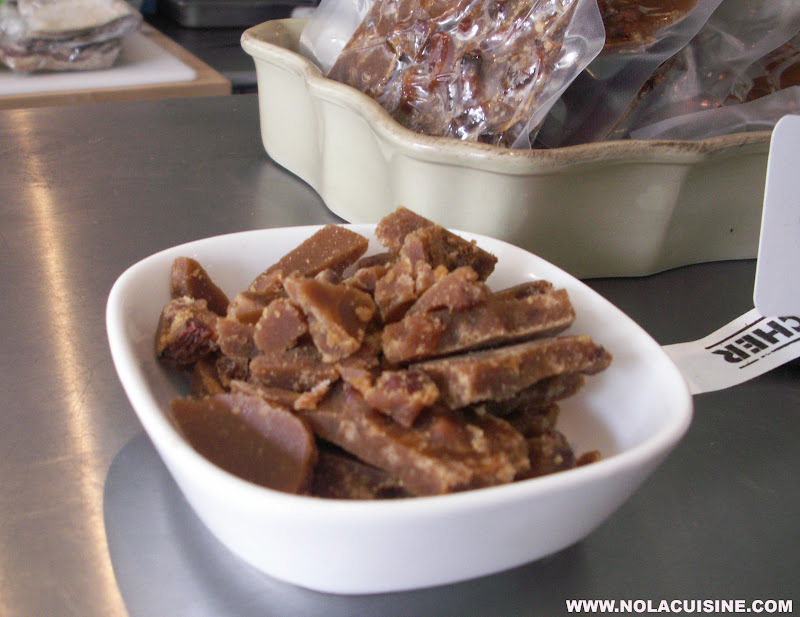 Real Cajun is mostly cookbook and part memoir, which all builds wonderfully around the recipes, just the kind of cookbook that I love, and reminiscent of another favorite of mine, Marcelle Bienvenu’s Who’s Your Mama, Are You Catholic, and Can You Make A Roux? What comes through in both books is a love of Louisiana, real Cajun cuisine, family, and tradition. I also made the Chicken & Dumplings, a lot of great technique in this recipe, the best I thought was putting the pan into a 450 degree F oven to finish the dumplings. 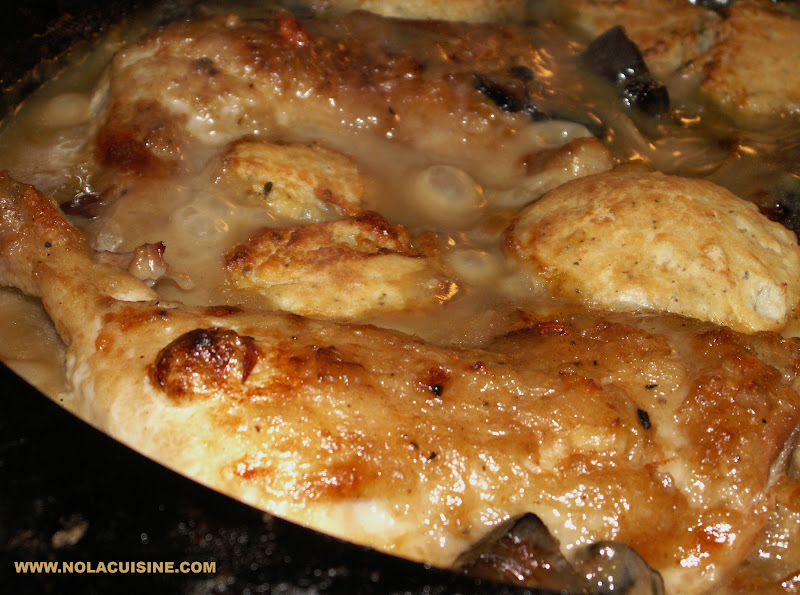 The stew is very similar to my recent Chicken Fricassee recipe, but the real magic happens when the dumpling batter is added and the whole pan is popped into the 450 oven. By the way, I made this for my wife and my Mom & Dad last night and they said the dumplings reminded them of Thanksgiving Stuffing, I agree. 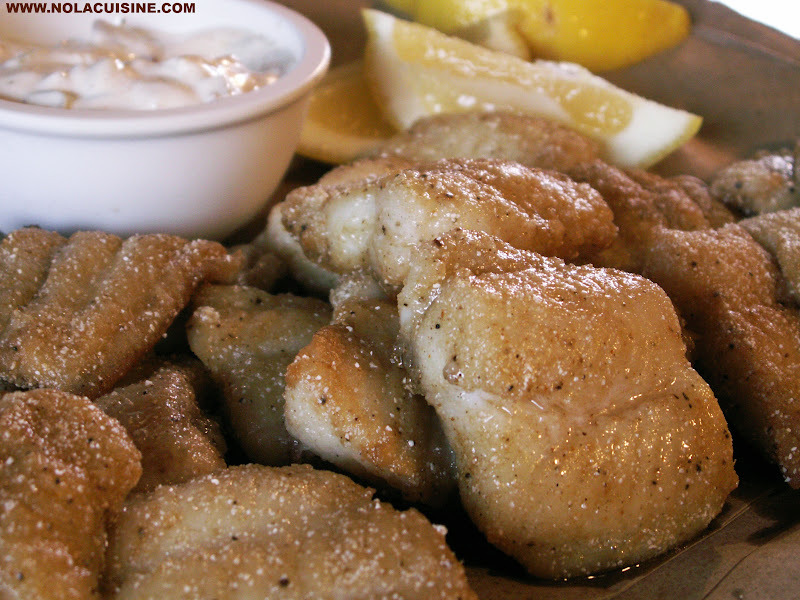 Awesome flavor with the addition of dried Oregano and raw minced onion. I also used the Buckle recipe, but used Blueberries as they were the best fruit that I could find, his is made with fresh Peaches which aren’t in season right now. 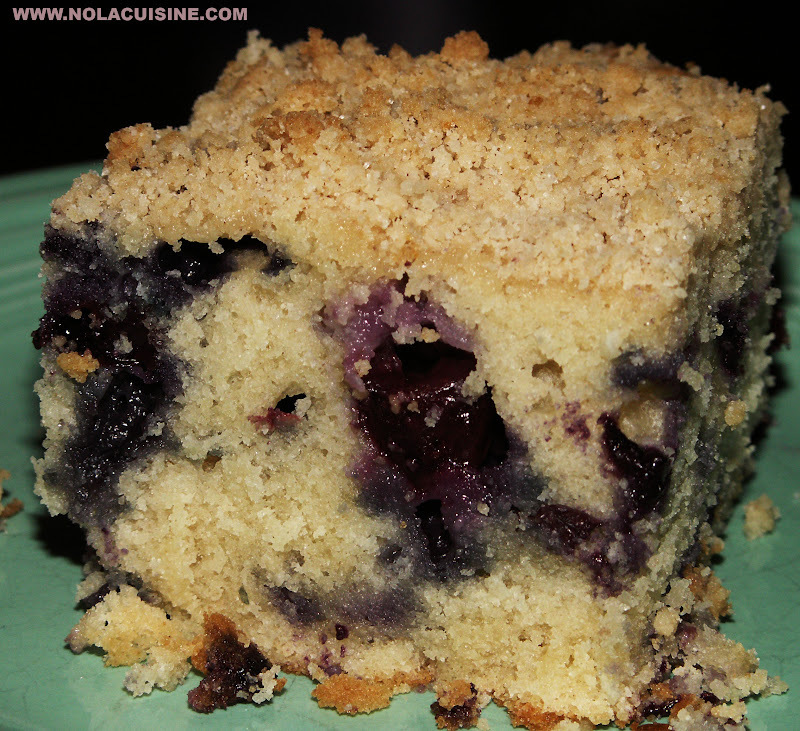 The Blueberry Buckle was dessert last night with good strong French Market Coffee, following the Chicken & Dumplings. All in all, I haven’t been this inspired by a Louisiana cookbook since first reading the year 2000 publication of Commander’s Kitchen by Ti Adelaide Martin and the late great Jamie Shannon. I don’t recommend just anything, but I really think that this a great book, loaded with not only great recipes, but stories to go with each one. My copy is already getting a little worn, the page with the buckle recipe has some dried egg white on it, the back cover has a sticky substance from my kitchen counter. All signs of a good cookbook I guess. 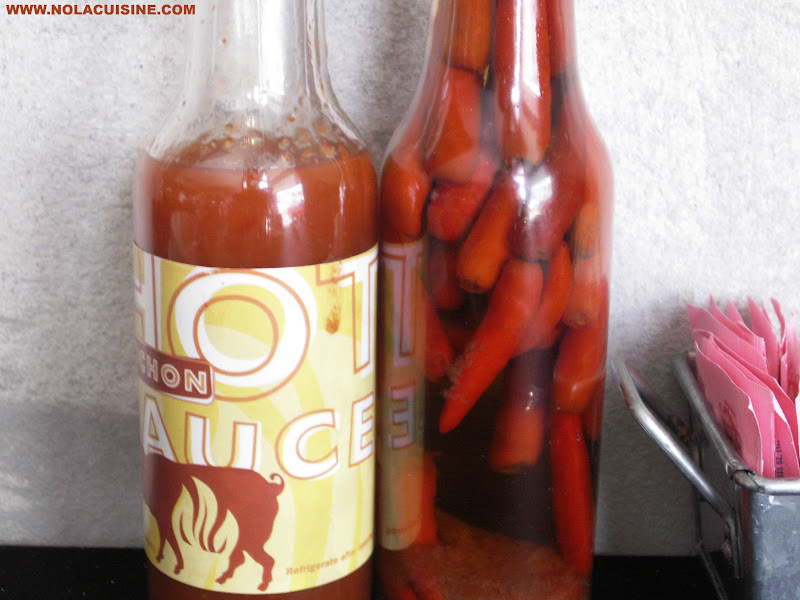 Be sure and check out my ever growing Index of Creole & Cajun Recipes which links to all of the recipe featured on this site! 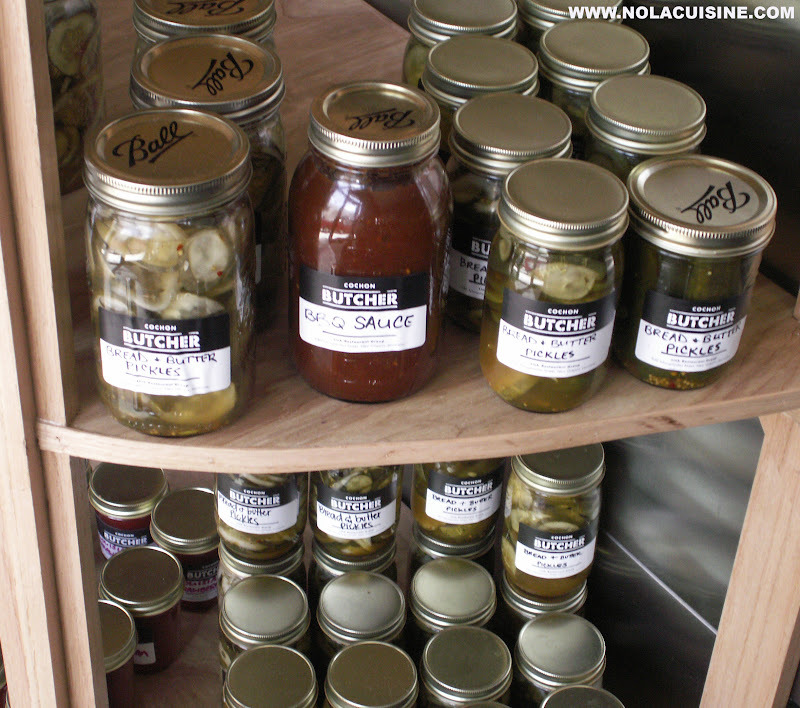 Also take a look at my Bibliography of Creole & Cajun Cookbooks! appetitesbacon fatbayonablueberry buckle recipecalcasieucatfish fried in bacon fatchicken and dumplings recipechris grangercochon butchercochon cookbookcochon de laitcochon restaurantCommander's Kitchen : Take Home the True Taste of New Orleans With More Than 150 Recipes from Commander's Palace Restaurantcubandonald linkdonald link's boudin recipeella brennanfrench market coffeegourmet magazineherbsaint bar and restaurantherbsaint cookbookhurricane katrinajamie shannonjudy walkerlouisiana cookbookmarcelle bienvenupaula disbrowepeach buckleReal Cajun: Rustic Home Cooking from Donald Linkâ€™s Louisianasan fanciscosatsumastephen stryjewskisusan spicertassoti adelaide martintimes picayunewarren stephenswho's your mama are you catholic and can you make a roux? 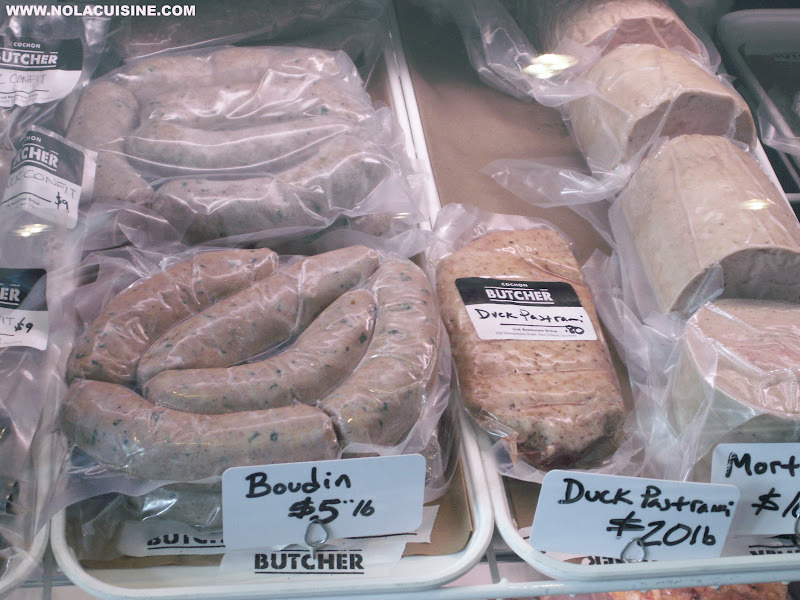 Upon entering Cochon Butcher, which is right around the corner from Cochon Restaurant and in the same building on Tchoupitoulis and Andrew Higgins, the first thing that I laid eyes on was their Andouille. 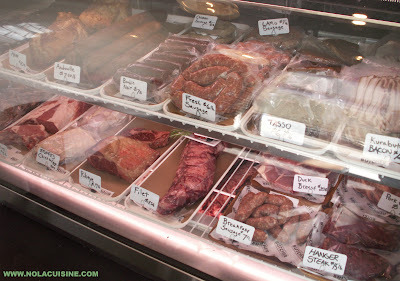 Nicely laid out in the deli case, deep brown from hours of smoking, and as a true Andouille should be, huge as it’s stuffed into a beef middle casing. 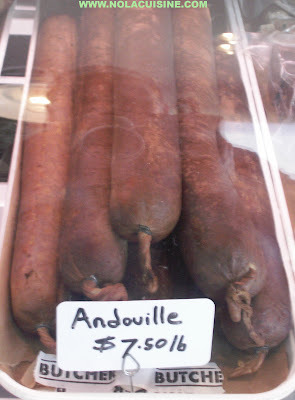 The first thing that I thought of is that New Orleans locals, thanks to Chefs Donald Link, Stephen Stryjewski, and Warren Stephens, will no longer have to make the commute out to Laplace, Louisiana (read my Jacob’s Andouille post) to get Andouille if they don’t want to, the real article is right in the city now, along with scores of other wonderful products. 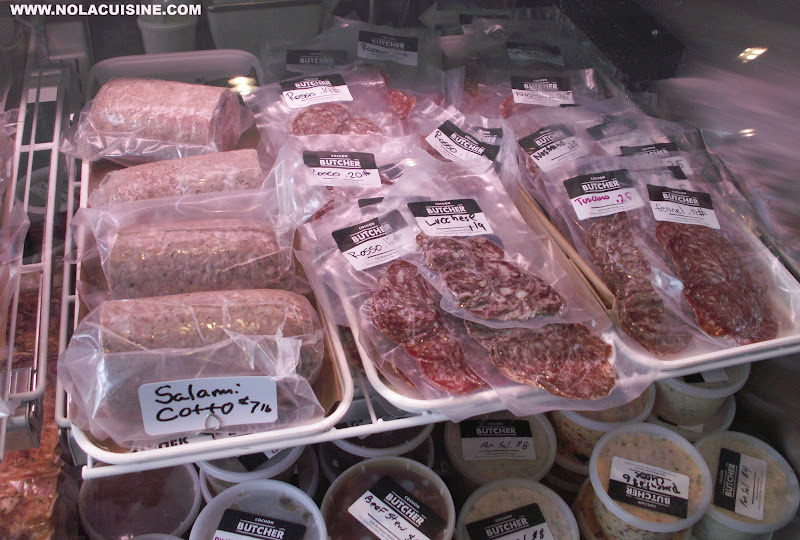 All of the sausages, salamis, Mortadella, confits, terrines, rillettes, pickles, Creole Mustard, EVERYTHING is made in house! 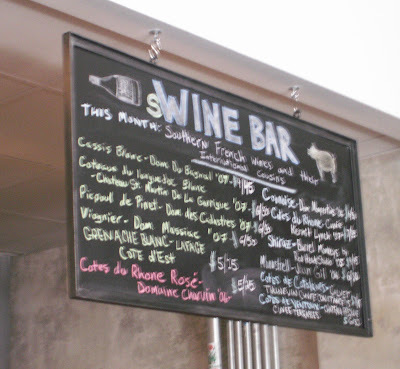 This place is a Mecca for all things swine, even more so than Cochon Restaurant. Feel like making a Cassoulet? 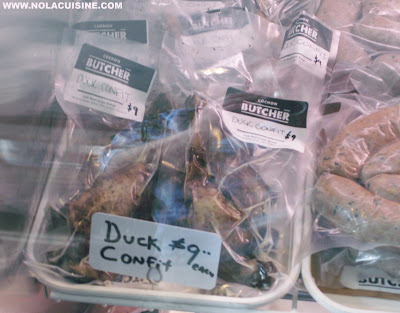 Hell, stop into Cochon Butcher, get your Duck Confit, fresh sausages, cured sausages, whatever you want to include, they will probably have it. 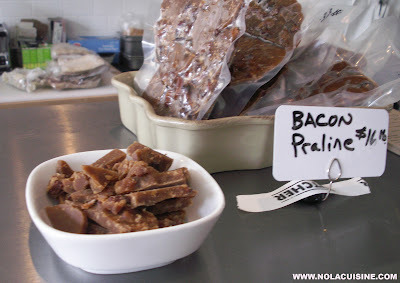 I was greeted at the deli case by Chef partner Warren Stephens holding out a sample plate of the house made Bacon Praline, which, as my friend Tim at Roux-B-Doo’s says, is like sugary crack. Seriously, it is. This isn’t the Praline Bacon at Elizabeth’s, awesome in it’s own right, rather it’s an actual Praline with chunks of the house made Kurobuta Bacon inside of it in place of the traditional Pecans. Awesome flavors. 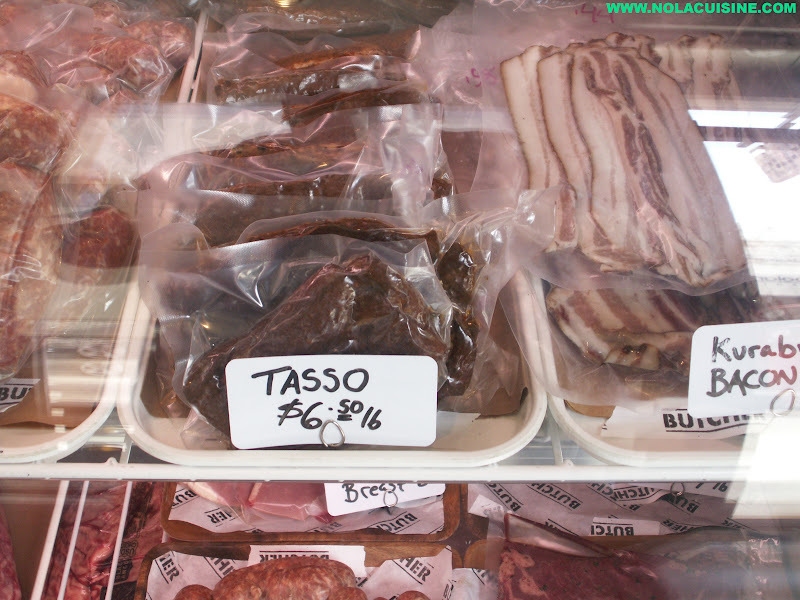 After coming off of the rush of the Bacon Praline, I asked Chef Warren if it would be alright to take some pics around the store/sWine bar. 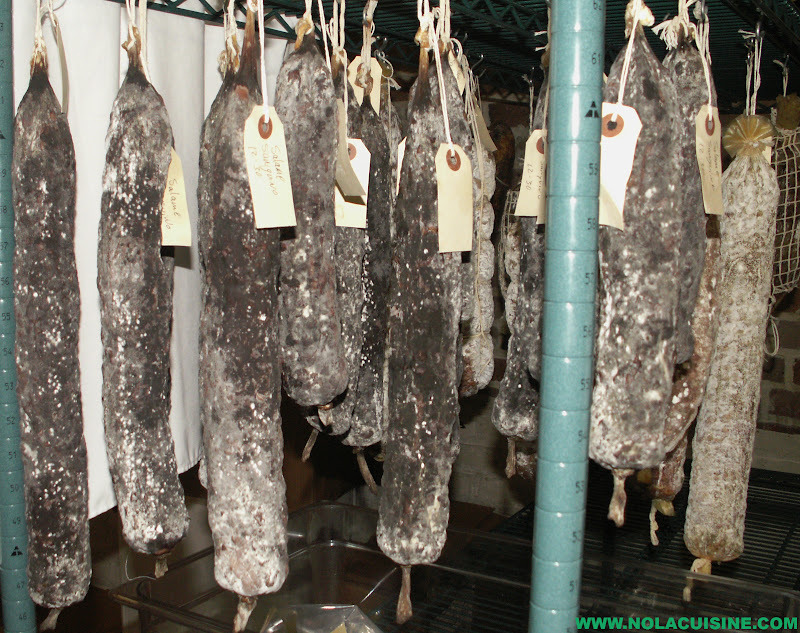 He said sure and asked if I would like to go upstairs to see the curing room. I said hell yes, of course. 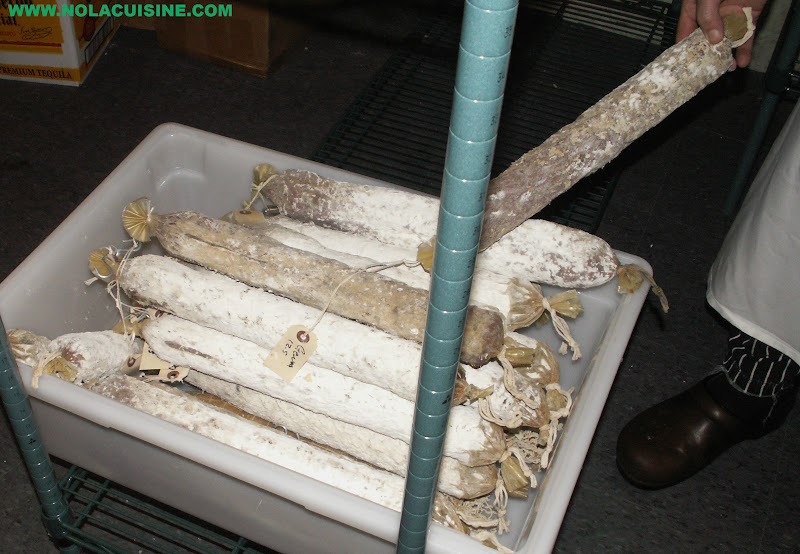 He led me upstairs through the upstairs kitchen to the temperature controlled curing room, one of them actually, there is another one at Herbsaint, as well as the ones in the downstairs display cases. 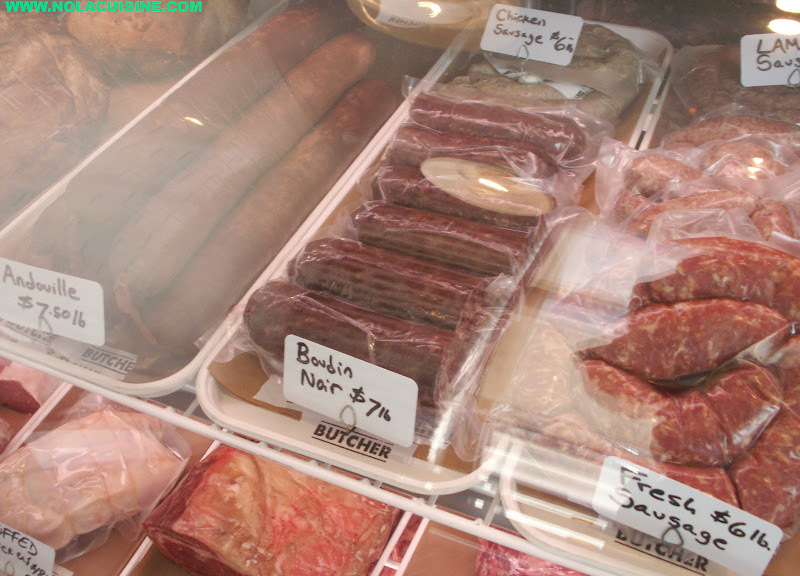 Inside of the upstairs room was a treasure trove of Salamis, blood sausages, you name it, in various states of cure. 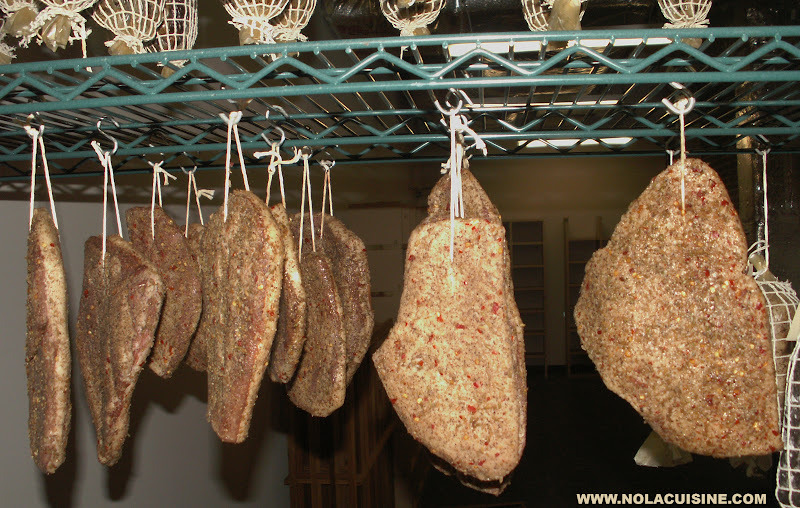 A new batch of Duck Pastrami was recently hung. 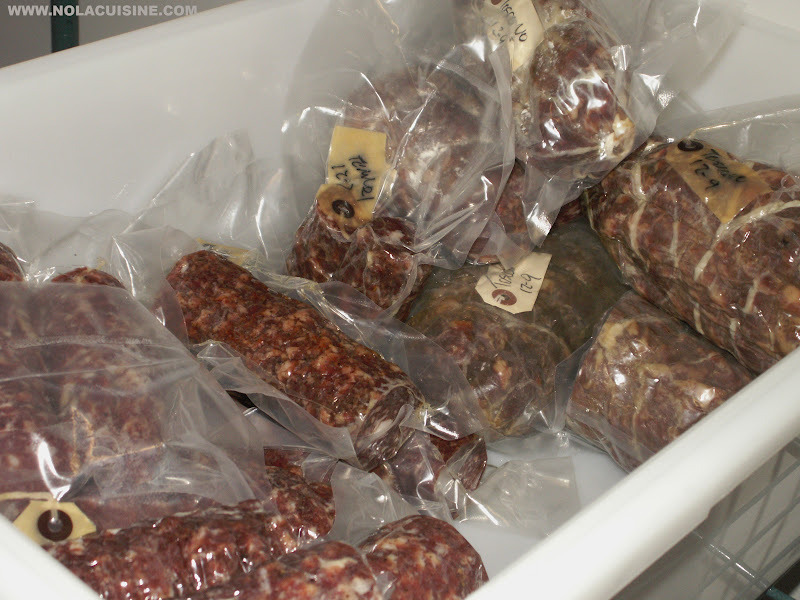 Chef Warren told me that when the cured products reach their maturity, they are Vacuum sealed to stop the curing process, and also package for sale or storage. While we were upstairs he also gave me a tour of Calcasieu the also newly opened catering facility for private events (I will do a separate post on Calcascieu). 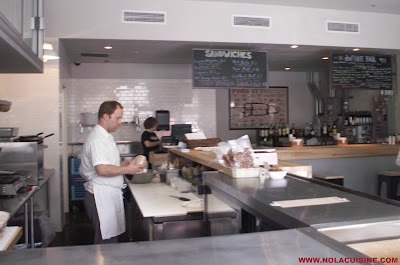 We headed back downstairs so that I could order something for lunch, looking at all of that great food was killing me. 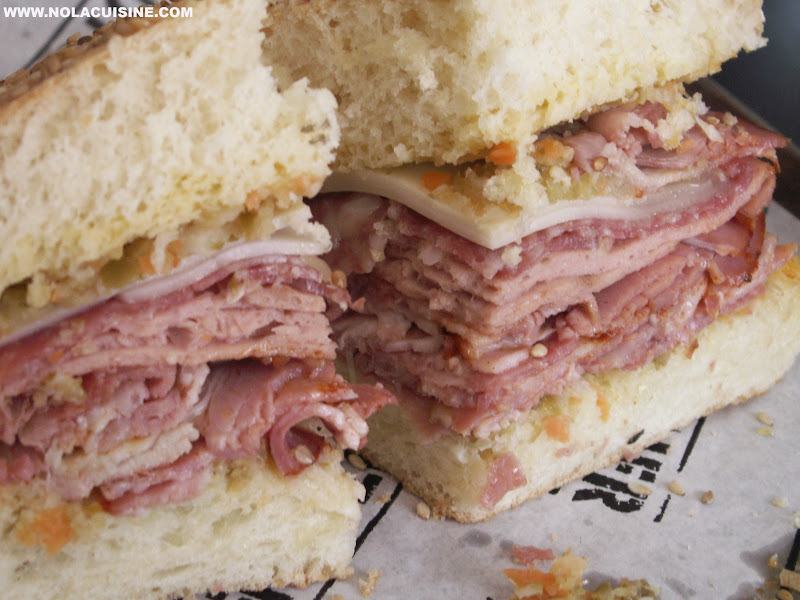 I decided to order the Muffuletta, with all house made meats no less. 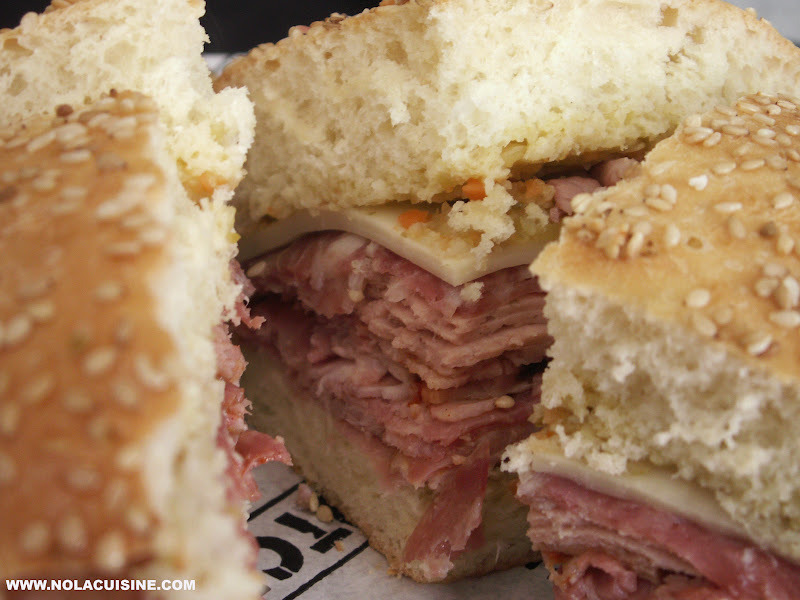 Any loyal reader of my site knows that I would HAVE to order the Muffuletta on my first visit knowing that I am a Muffuletta junkie, and let me tell you, this one did not disappoint. Cochon Butcher’s Muffuletta has an olive salad that is very finally chopped which I didn’t know if I would care for, as I usually prefer the olives pretty much just crushed a la Central Grocery, but it actually was a perfect accent to the finely cured meats and the cheeses without being overpowering. The olive salad was on the top and bottom of the sandwich. The bread was also perfect, light and crumbly as it should be. 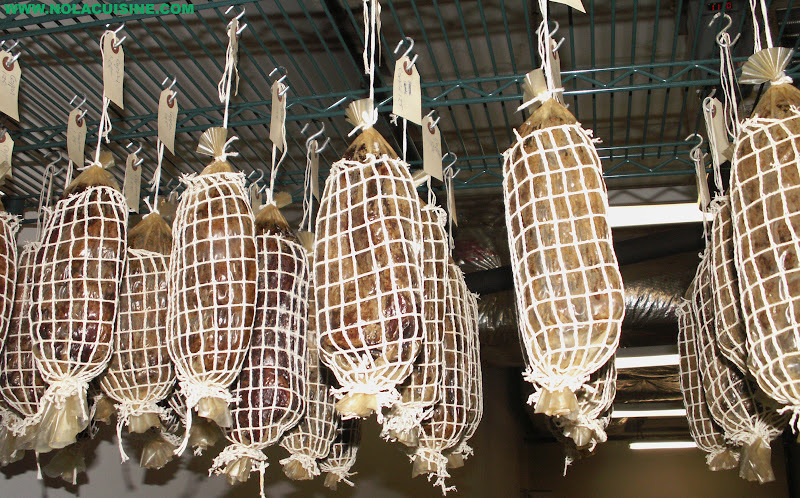 The Muffuletta could easily feed 2, in some cases 4, and at $12, especially considering everything is made in house, it’s a steal. While I was gorging myself on the above awesome Muffuletta, Chef Warren brought me over a Lagniappe to try out, his Tartiflette that he was featuring as a small plate item. 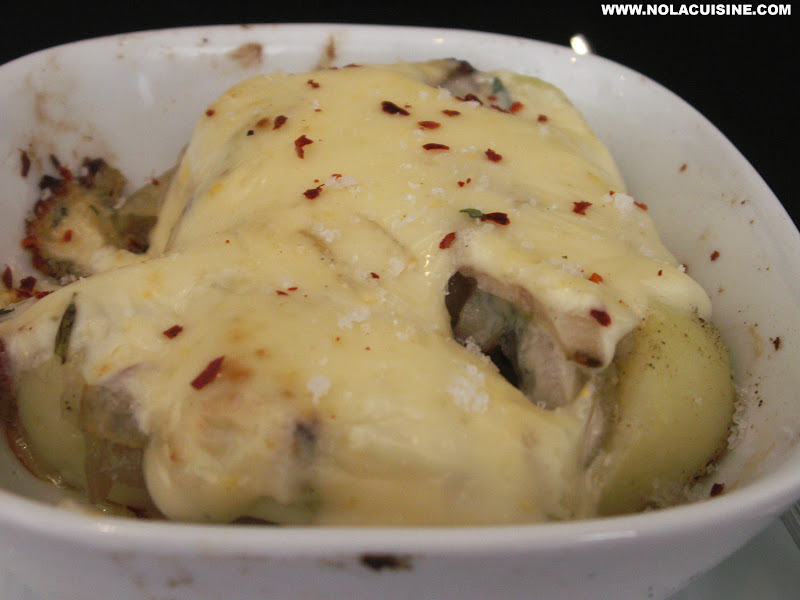 It was a lovely pairing of fingerling Potatoes, housemade Kurobuta Bacon, sweet onions, and a touch of heat, baked in a Gratin with of course the wonderfully stinky Reblochon cheese. Phenomenal flavors; the smokiness of the bacon, the sweetness of the onion, tender gold and buttery fingerlings, woodsy Thyme, and the spice of the peppers all tied together with the Robust creamy flavor of the Reblochon. Awesome job. I can’t thank Chef Warren Stephens enough for the gracious tour, I will always remember it! 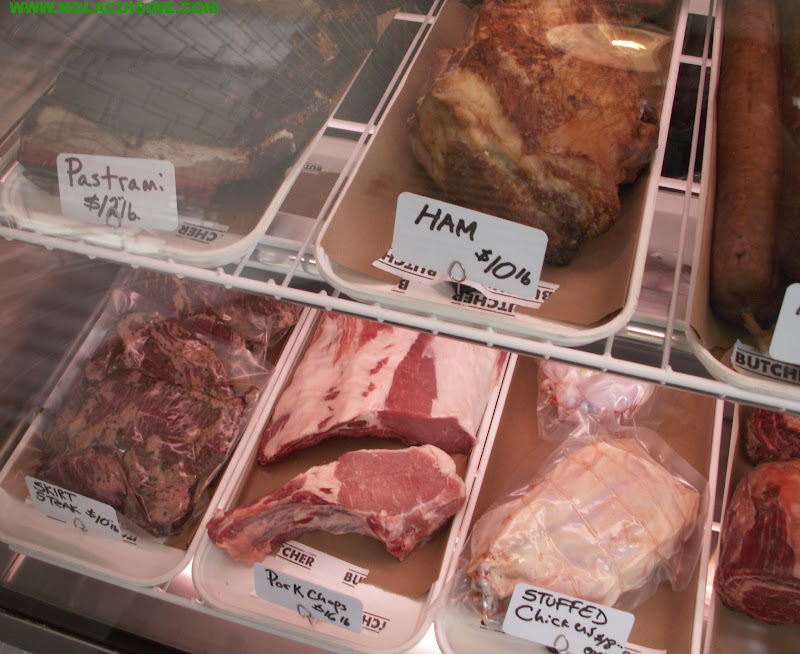 I will let the pictures do the talking for all of the wonderful items Cochon Butcher has to offer!